There have been no blackouts since Merkel's announcement. On the contrary, Germany's grid, which was already the most reliable in Europe, experienced a total of just 15 minutes and 31 seconds of brownouts in 2011, an improvement over 2010. (The comparable figure for the United States is measured in hours.) The wholesale price of electricity has gone down, not up. 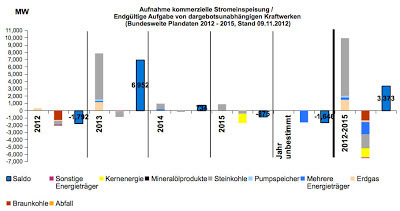 The electricity-intensive German manufacturing sector is still thriving. While not literally false, the problems of the German grid have grown, and neighbours are taking steps to protect their grids from Germany's. The problem is not blackouts; the issues the grid is increasingly experiencing is brief fluctuations in power, as Spiegel Online noted in Grid Instability Has Industry Scrambling for Solutions. 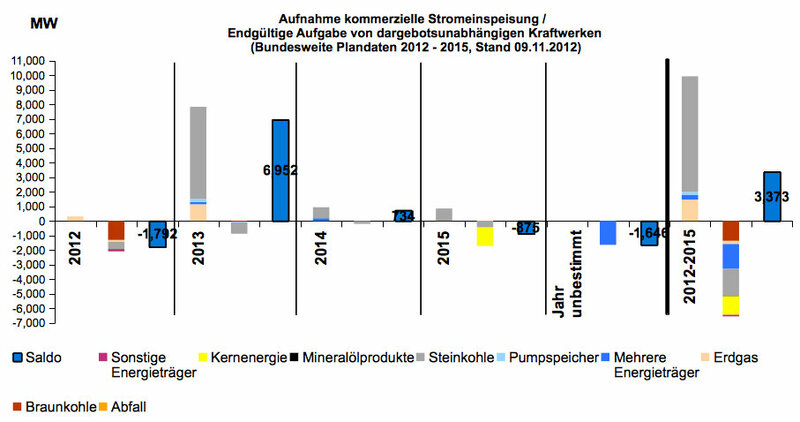 The "wholesale" price is down because of excess generation, with retail rates for customers not exempt from paying for renewable energy increasing - the EEG, renewable surcharge, will increase over 47%, to 5.3 euro cents/kWh, in 2013. 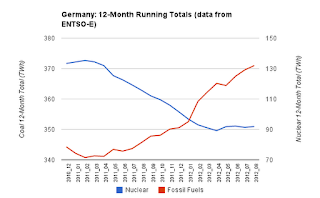 The German Energy Agency (dena) predicts that in 2050 the system will still require coal/gas to provide 60% of secure capacity, and the most current figures from ENTSO-E indicate that even after 12-month totals for nuclear production stabilizing year after the 7 units were removed from service, generation with fossil fuel sources continues to climb.